Here is something to think about. When you hear a song in your own language, the music gives you the emotion while the words tell the story. But if you hear the same song in a language you don't understand, it's all emotion. Your brain has to figure things out using a different set of cues. Same thing with live theater. 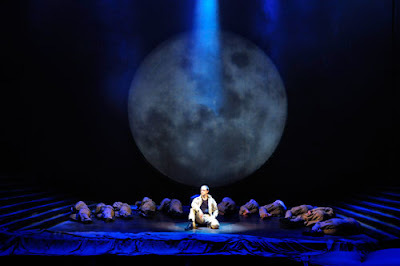 The sets and lighting and music give you the emotional cues and the dialog and acting tell the story. But what if there is no dialog? What if the actors are pieces of cloth, chopsticks and tin cans? In the world of Liebe Wetzel's Lunatique Fantastique, where puppeteers clad entirely in black maneuver found objects across a darkened table on the small stage, there is nothing to go on but emotion. Her "Executive Order 9066," which is the story of one Japanese-American family uprooted during World War II and sent to a relocation camp in Topaz, Utah, is a masterpiece of pure theater magic. Not one word is spoken during the one hour performance and none are needed. The puppeteers' art is brought to a high level again and again, especially with the representation of President Roosevelt, the prison guard and, most of all, the heartbroken Japanese-American Mom. How is Mom represented? 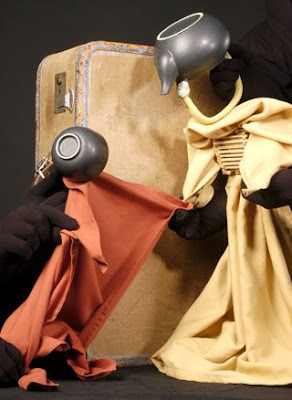 With an upside-down teakettle for a head, a piece of cloth for a kimono and, at times, chopsticks for arms. Her teakettle is pewter-colored. How do we know her pre-war friend is not Japanese? Their teapot heads are different colors: the friend's is white, and her "dress" cloth suggests a gingham fabric. These little clues force us to pay attention, and when we do we discover a gripping story emerging from the silent world. The San Francisco Theater Blog Awards Division awards "Executive Order 9066" Three Stars with Two Bangles of Excellence. Since the cast is hidden it is impossible to single anyone out, but Animators Jen Colasuonno, Sheila Devitt, Anna Fitzgerald, Susie Gaskill, Benjamin Turner and Patricia Tyler made this boy cry. That's saying something, especially on a Saturday afternoon at 1PM. One BANGLE of Excellence is for F.D.R. -- we can't remember exactly now they managed to convey the wheel chair but the cigar, we think, was a pen. The other BANGLE is for the bleak landscape of the internment camp, suggested by sand spread across a sheet of wrapping paper, with tin cans on the end for the camp boundaries. Other tin cans conveyed the floodlights from guard towers. The battle scene was also excellent: The German soldier's tea cup head was, of course, black. What a marvelous show. They stalk each other around the large rectangular kitchen table with the Count's unpolished boots standing in the middle, the tall man wearing the livery of a foot servant and the young woman resplendent in a lime-green ball gown. They speak little, but the sexual tension conveyed in this one scene, written in 1888 by the Swedish master August Strindberg, was for many years considered too hot for decent theater. 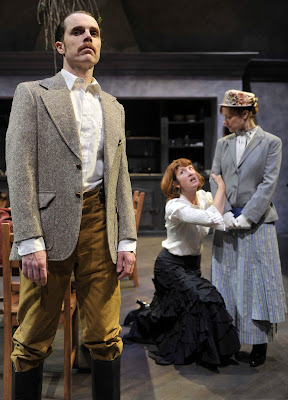 Aurora Theater Company's remounting of "Miss Julie," directed by Mark Jackson in one act of ninety minutes with no intermission, simply crackles with energy, realism and wit. Jean (Mark Anderson Phillips), the valet of the unseen Count, is engaged to Kitchen servant Christine (Beth Deitchman), but he is not-too-secretly angling for the Count's daughter, the gorgeous and irrepressible Julie (a remarkable role for Lauren Grace). But 'love' is a charged word for Jean, as he understands that his status as a servant leaves him an impossible distance from a relationship with an aristocrat like Miss Julie. "We (servants must) treat love as a game, when we have time off from work," Jean says. "I could love you, but you could never love me." Phillips imbues Jean with class anger and a bit of disdain for all women, not a surprising theme to spring from the pen of a noted misogynist like August Strindberg. But where Jean's anger is readily understandable, Miss Julie's attraction to the valet is the engine that drives this vehicle. She sees life as basically impossible: "Everything is a scum that's floating -- floating across the water until it sinks." She is hoping Jean can give her something to live for, but his heart is cold. 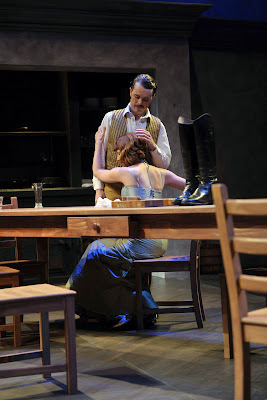 Christine, whose sensible, Christian nature seems no match for Miss Julie's worldliness, is in the end Strindberg's moral center -- it seems inevitable that Jean will end up with Christine and not Miss Julie, but the finale is shocking nonetheless. Special note must be given to the fascinating sound pastiche by David A. Graves, which begins with country banjos and morphs into a John Cage-like series of sustained horns and strings. Scene after scene, the music is a welcome touch, especially with so many pregnant silences accompanying the steamy looks. 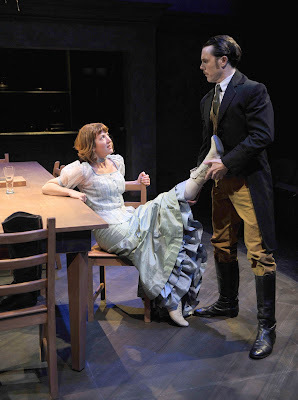 The San Francisco Theater Blog Awards Division awards 'Miss Julie' Four Stars. It couldn't be less -- in many ways, this is a perfect night of theater. The writing, acting and directing are superb and the compact Aurora is an excellent venue for such an intimate story. Let us not forget to mention wonderful period costumes by Jessica Peter and evocative lighting by Heather Basarab. And Lauren Grace is a treasure. 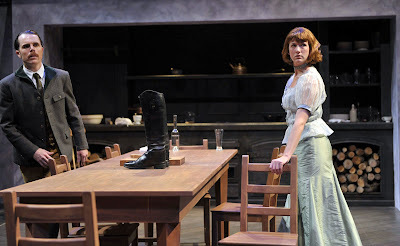 Don't miss 'Miss Julie' -- you will be touched by the simplicity of this timeless story. You get Achilles in sweat pants, Patroclus in white undies and Zeus in a blue fighter's robe. You get Aphrodite descending on a celestial swing that is as vaudeville as Olympic. You get the Trojans and Greeks wearing red and black berets with modern camo uniforms which make them look like El Salvador versus Honduras in the Soccer War of 1969. And you also get the fabulous A.C.T. 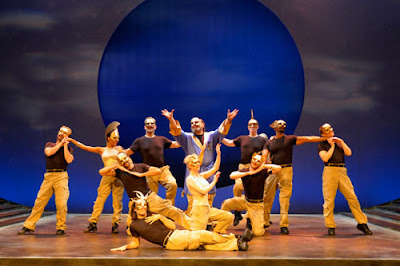 company, each man and woman acting in at least three roles, as all of Homer's immortal gods and men are reassembled on the Geary Theater Stage. Why? You've got to ask yourself. In 1997 English poet Christopher Logue finished his translation of several books of Homer's "Iliad," with help from Homeric scholar Donald Carne-Ross. 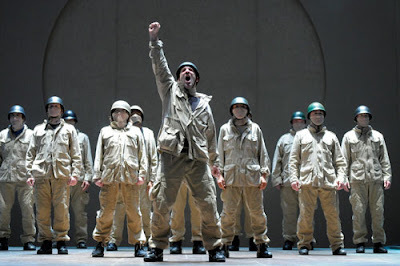 Entitled "War Music," this translation excited playwright Lillian Groag so much that she took it to Carey Perloff, Artistic Director of A.C.T. and persuaded the company to donate several years of hard work to collaborate on a theatrical version of "War Music." Clearly, it was a tremendous effort on A.C.T. 's part, involving Perloff, Groag, composer John Glover and choreograper Daniel Pelzig. But the World Premiere shows it takes more than sweat equity and a familiar war to excite an audience. Act One is confused and Act Two feels like it is not Troy but San Francisco being besieged, with the bloodthirsty enemy at the exits refusing to allow anyone to leave the theater until Achilles finally stops sulking, stirs his stumps and jumps into the fray. Maybe it's all the multiple roles. 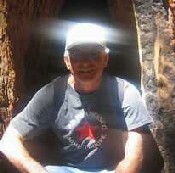 Maybe Jud Williford, so good in so many previous A.C.T. productions, shouldn't be asked to play a heel, the capital of France and the home of rhythm and blues (Achilles, Paris and Apollo). Maybe Agamemnon, the baddie of baddies, should have been played by someone nastier than Lee Ernst, preferably a seven footer with a scar. Maybe Rene Augesen, whose Helen is as vain as only the most beautiful woman in the world can be, could do more than utter the only unforgettable line of the evening: ("A world war? For ME?") And possibly they could trim a FEW characters -- thankfully Poseidon (played to great comic effect by Anthony Fusco) had his trident spear, else we'd have lumped him in with all the other P's -- Paris, Patroclus, Priam and Pandar. Of course, this was Opening Night, the first performance of many that will follow, as company and author attempt to whittle. At the story's heart is nothing less than the human condition -- our hubris is bound to get us, and when it does we can't even count on our Gods to save us. They're worse than we are. The San Francisco Theater Blog Awards Division is exceedingly thankful to A.C.T. for this ambitious World Premiere in our city. Nonetheless, Two and a Half Stars is the best we can do for now, with a Bauble of Shame thrown in for good measure. While we can't be enthusiastic in our response, we can single out Gregory Wallace for his sensible Hector, Erin Michelle Washington for her energetic Athena, and Willis and Augesen for their excellent Zeus and Aphrodite. 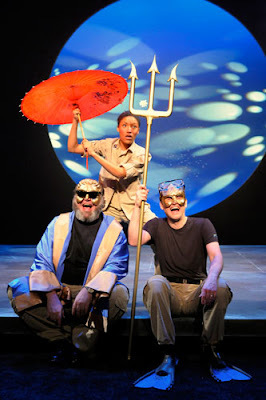 Daniel Ostling's lunar/solar set was terrific to look at and -- we guess -- Beaver Bauer's costumes gave the playwright the absurdist and modernist look he desired. The Bauble of Shame is for John Glover's heralded music -- without a live orchestra (cut, as always, for cost considerations), it really better be good. Yawn and double yawn. And the vaguely hip hop track during one of the battles -- oh, please.